We know that shopping locally keeps retail dollars in the community. But now more than ever, shopping independently-owned boutiques also supports local creative people whose lines of jewelry, clothing and accessories are offered there. Fortunately for WNY shoppers, the word “boutique” doesn’t necessarily mean “expensive.” So whether you’re searching for formalwear, gifts or basic wardrobe staples, these Buffalo boutiques have your back…and most offer options at multiple high-low price points. Here are some of our favorites. Lexie Furlong and Vicky Schaff opened Blush on Elmwood Avenue two years ago and are now working to open a second location in Orchard Park. The store caters to everyone from chic Elmwood fashionistas to suburban moms and Buffalo State students. There are also locally-made products (below) and some great brands. The local edge: Handmade “Cosmic Lotus” bracelets (beads and crystals), body chains made by Nicole Davis, and reasonably-priced mala bead necklaces by Mama Namaste. Products we love: House of Harlow (Nicole Richie’s jewelry line), Giving Keys necklaces. Let’s face it…we all dread bathing suit shopping. But one local store makes the whole process much more tolerable — and dare we say fun? Blum’s goes above and beyond to find you a swimsuit or bra that fits perfectly and feels as amazing as it looks, offering an old-fashioned fitting and tons of helpful one-on-one service. Products we love: Bras of the month from Wacoal and a range of bra and swimsuit styles in specialized cup sizes. Plus a large selection of swimsuits in all sizes/styles. Sue Morreale and her daughter Ciara are a force in Buffalo women’s retailing, with a philosophy of empowering women. Besides offering clothes and jewelry that make women feel beautiful, the boutique works with schools, the American Cancer Society and Children’s Hospital, and also hosts an Elmwood village-wide “bra crawl” in support of breast cancer awareness every October. The local edge: Ziglets (Buffalo-inspired jewelry), Colleen Darby Designs (paintings), Exo Nail polish remover, Dawn Josephine (industrial-chic jewelry). Products we love: Buffalo-inspired apparel from Rusterior Design, Mandala meditation kits, Her Story Collection jewelry. Main Street in the Village of Williamsville is seeing an expansion of new local businesses, with one boutique standing strong since 1998: Leelee. Owner Lisa Keating wanted to open a store where mothers and daughters could shop together, and delivers on that promise with great brands and items ranging from formalwear and trendy casual wear to dresses suitable for a high school dance. Products we love: Casual wear from Michael Stars, necklaces from Pegs Hardware, jewelry from BeYou. “The way we approach retail is not that you’re expected to buy, we want you to become a friend. We want you to enjoy Hertel,” said Modern Nostalgia manager Erin Habes. For “Mod Nos,” as it’s known to insiders, it’s all about community, with regular free yoga classes, DIY workshops, and collaborative events with other North Buffalo businesses. They’ll also be opening a second store at Canalside this summer. The local edge: Once and For All clothing (designed and made by Buffalonian Molly Hoeltke), Pegs Hardware and Mahina (locally-designed nature-inspired jewelry). For the men, Ian Michael & Co. socks. Products we love: Anything from Good hYOUman — affordable apparel with feel-good phrases. After running her fun/funky East Aurora boutique for a few years, owner Crista Botticello decided it was time to put her ideas in motion…literally. Now you’ll find Ooo la la roll up to events, parties, fundraisers and fashion shows as a shoppable fashion truck. Look for the truck this summer at the Batavia Open Market, weekly events in Williamsville with Scenic Salon, and at Village Designs in the Elmwood Village. Expect cute, affordable apparel, accessories and unique gifts at Sarah Danielle. Located in the historic Ellicott Square Building, Sarah Danielle’s mix of local items and designer-inspired apparel is a draw to locals and tourists. The local edge: Wrafterbuilt (handcrafted furniture and fixtures), Linwood Candles (small batch soy candles), Gridlock Lacquer (locally-made nail polish), Ian and Michael Co. (socks), Gizmo’s jewelry (Buffalo Nickel earrings). 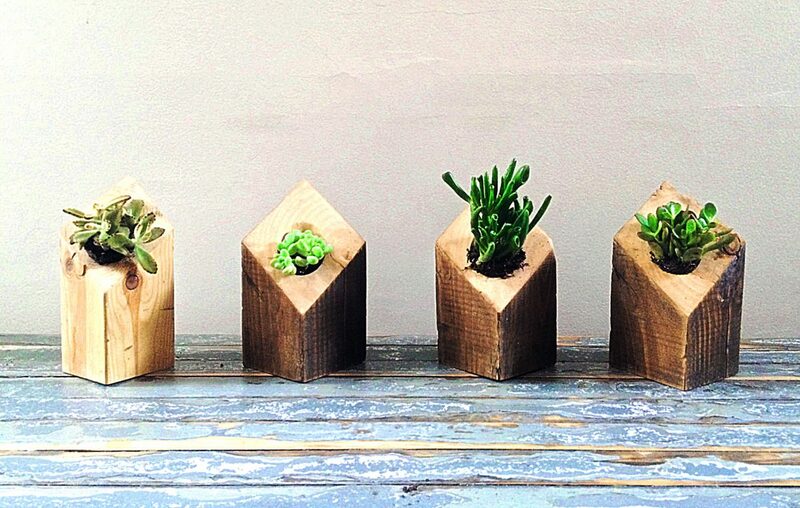 Products we love: Succulent planters from Wrafterbuilt — they’re made out of wood from old downtown houses. Also, the “Neighborhood collections” from Gridlock Lacquer — nail polish inspired by Allentown, the Elmwood Village and more. One person’s trash is another’s treasure…and Second Chic proves it. With the popularity of vintage and DIY projects on the rise, it was natural for Second Chic to expand from its original store on Elmwood; locations now include Hertel Avenue and Williamsville. Unlike many crammed, hard-to-shop consignment stores, Second Chic feels much more “upscale boutique” — with finds that reflect it. Of course you never know what that may be: “Consigners shape the store,” said Katie Smith, Williamsville store manager. Red Siren will be Canalside’s first retailer, and early indications are that it’s well-worth looking forward to. Opening soon, the nautical-themed boutique will carry luxury brands new to the Queen City. “It’s a store with a mission and will be part of the economic development of Buffalo,” said owner Sharon Randaccio. Products we love: With over 70 brands, it’s hard to choose! For preppy girls there’s Skirtin’ Around, for casualwear check out Mia & Moss or BB Dakota, and for a night on the town try looks from Carmen Marc Valvo or Rebecca Taylor.